MID-WEEK SALE ENDS THURSDAY: This model is currently OUT OF STOCK. 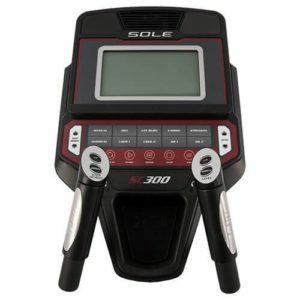 Click here to check out other Sole Fitness Ellipticals. When it comes to buying a new elliptical trainer, we tend to be snobs. We like high quality machines with sturdy design, smooth motion, motivational programs, and effective features. In general, the machines we like cost more than $599 and come from companies like ProForm or Horizon. Still, there is certainly a need for lower quality machines like Merit. This brand is perfect for people without any sort or remarkable requirements who just want an inexpensive machine to use for exercise. 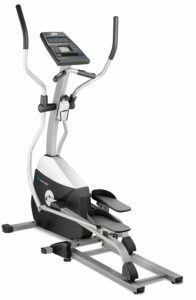 These users may have a limited budget but want something that can help them get off the couch and back into a regular exercise routine.The Merit 725 E Elliptical Trainer is available to purchase from Amazon. Merit is built by the same manufactures as Horizon Fitness. This is a good company which offers quality customer service. Merit is their budget machine line. Front Drive Design – Front drive machines a nice because they take up a little less space in your home than the rear drive options. They also have rollers that run on tracks that can contribute to noise and a rough motion if not done well. We’ve found that the Merit ellipticals often start off with smooth motion, but develop creaks after several months. This is especially a problem with larger individuals. 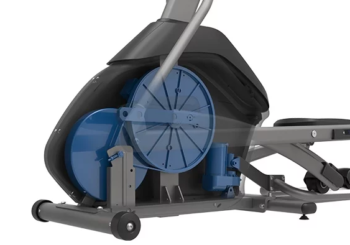 Light Flywheel – A light flywheel is a good indicator that the motion on the elliptical will not be silky smooth. 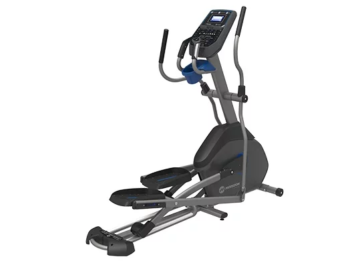 The Merit ellipticals have decent motion for the price. You won’t like the feel of this machine if you’re expecting the same quality as your local health club. However, if you’re just looking for an inexpensive at-home option, this will work. 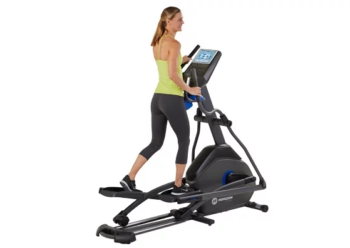 Short Stride Length – The stride length on the Merit ellipticals is usually around 16″ and will work okay for petite people. Anyone pushing 6-foot is going to feel cramped. Lower Weight Capacity – This particular point should be emphasized. The weight capacity is officially listed at 275 lbs for these machines, but we feel users should probably be under 200 lbs. Otherwise, the ellipticals will rock and develop cracks. Limited 5 Year Frame Warranty – A short warranty like this indicates that the company does not put a lot of faith in their products. Most machines we recommend have Lifetime Warranties on their frames. LCD Console Window with Basic Stats – These are basic consoles without any special fitness tracking programs. You can get much higher quality tech consoles for just a few hundred dollars more. Worth the investment. These ellipticals are usually priced around $300 and you get what you pay for. However, we would say that they are worth the money. You’ll get a usable machine that will last you 1-3 years. It’s not going to work well for larger or taller individuals, but smaller folks should be okay. 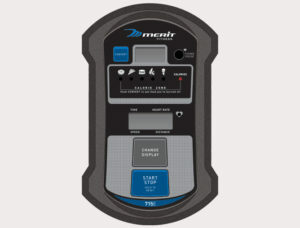 In fact, we were pleasantly surprised by the number of positive reviews for the Merit machines. You might consider spending just a few hundred dollars more and looking at brands like Horizon and ProForm. You’ll get MUCH better machines with longer warranties, better tech, higher quality components, and smoother action. 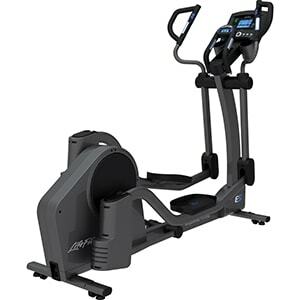 The Merit 725 E Elliptical Trainer is available to purchase from Amazon. 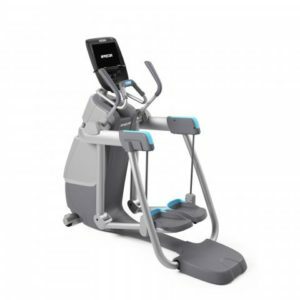 The Merit 715E Elliptical is an extremely inexpensive machine that may work well for certain users. Honestly, we were surprised by the number of positive reviews we found from customers. If you are a petite person who wants to exercise at home without investing a lot of money, then you may be perfectly happy with this machine. We should add that it is not very high quality. Users have found that the machine will last for a few years but does not work well for heavier users. Currently, this model is unavailable on Amazon, but you may want to check out a slightly more expensive model in the Merit 725E which IS available on Amazon for around $280. Otherwise, you may find models of the Merit 715E floating around the fitness world and available for purchase. The Merit brand is made by the same makers as Horizon Fitness. 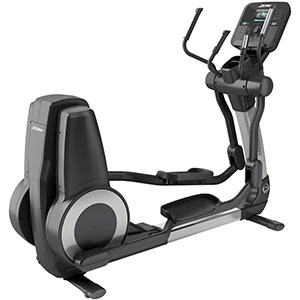 Let’s take a look at what you’re getting on the Merit 715E Elliptical. Front Drive Design – The entire machine weighs only around 100 lbs. This means it will not be incredibly steady while you workout. We’d recommend this machine only for petite, lightweight individuals. 10 lb Flywheel – The motion on this machine is not near as smooth as more expensive models. 8 Manual Resistance Levels – Sure, this works fine. 16″ Stride Length – This stride length will work well for people under 5’5″. That’s why we recommend this machine for petite users. Anyone over 6’0″ is going to feel very cramped. 2 LCD Windows with time, distance, speed, and calories – Nothing fancy. 275 lb weight capacity – We can’t stress this enough. This machine is NOT for larger users. In fact, even this weight limit is too high. We’d recommend this machine for people under 200 lbs. 5 year Frame Warranty – This is a short warranty to indicate that the manufacturers did not use high quality parts. Machines that we recommend almost always come with a lifetime warranty on the frame. No Water Bottle Holder – The photos for this machine often show a water bottle, but it is not actually on the machine. If you are a small person, you may be perfectly happy with this machine. Also check out the Merit 725E available on Amazon. 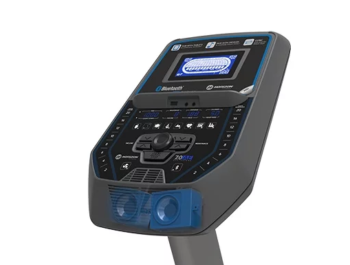 We actually recommend that you spend just a few hundred dollars more for a Horizon EX59 or ProForm Endurance 520E. These machines will be made of higher quality components, include workout tracking technology, better warranties, and last MUCH longer. The Merit 725E is available for sale on Amazon. The Merit 715E is not currently available for sale on Amazon. Our team tested out the Precor AMT Adaptive Motion Trainers at a health club and were totally impressed. They are extremely expensive machines but you can be sure they offer some serious value. The Precor AMT 833 is worth the price for sure. Now, you just need to decide if you have a spare $8,000 laying around that you are ready to hand over. Precor AMT 833 Adaptive Motion Trainer Sale! 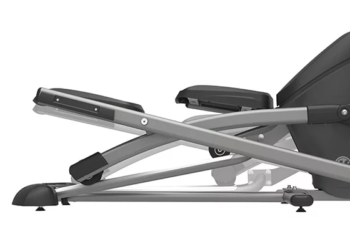 The Precor AMT 833 Adaptive Motion Trainer on sale for $8,295. We’ve toured the Precor corporate headquarters and must say that it’s an impressive facility. This is a company that is extremely watchful when it comes to quality control. They are always working to create the very best product. Plus, we’ve found the phone customer support staff to be extremely friendly and knowledgeable. 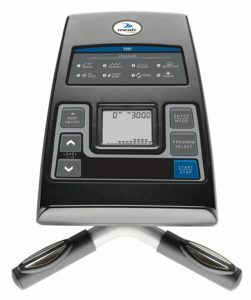 The AMT 833 Adaptive Motion Trainer is a unique machine that adjusts the stride length and height based on your body’s motion. Instead of a set pattern (like most ellipticals), this machine will adapt to your body’s motion for walking, running, short, or long strides. There is also an AMT 835 and AMT 885 with additional features. The adaptive movement design will respond to your body’s motion to create the perfect stride pattern. A normal elliptical has a set path that limits your ability to work lower body muscles. With this machine, you can change your motion at will. For example, you can do deep lunges to work your glutes/hip flexors/calves, short strides to work your quads, mid-range strides for hamstrings/glutes, or low-range strides for a more comprehensive lower body workout. You can easily adjust your stride from 0 to 36 inches! Again, this far exceeds a standard elliptical. Normally, your stride length would be limited to around 20″. This type of machine will help you burn calories more efficiently. The motion controls are easy to use and intuitive. Dual action will let you workout your upper body muscles. The console is well designed and shows your degrees of exertion, heart rate, calorie burn, and peak performance zone. Solid and stable design. This machine isn’t going anywhere during your use. The stride height on this machine is not adjustable like on the AMT 835 and AMT 885 models. The warranty on this machine only has 1 year on labor, which is not the best. However, the parts have a warranty of 10 years to indicate that they seldom need replaced. The price may be restrictive for some buyers. If you like the idea of an adaptive motion machine, but don’t have $8,000, you may be interested in the NordicTrack Freestride Trainers for a similar design and MUCH lower price. 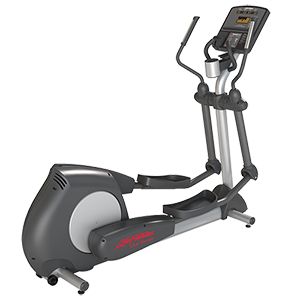 We kept hoping we’d see adjustable stride with the E1 and E3 Ellipticals from Life Fitness. Finally, here it is.. the perfect package! 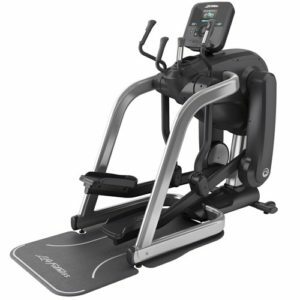 The E5 Elliptical is a premium machine that sells at a premium price. You can be confident that any purchase from Life Fitness is going to last for the long haul. You just need to decide if you can cough up the bucks to make the initial purchase! Life Fitness E5 Elliptical Sale! 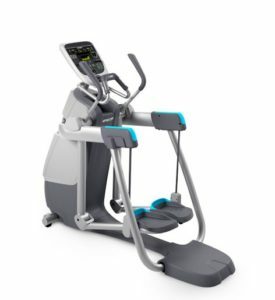 The Life Fitness E5 Elliptical typicall sells for $4,299. The adjustable stride on the E5 Elliptical is the feature we want to highlight since it is not available on the lower E1 and E3 models. The stride can adjust from 18-24″ at the touch of a button. This feature is extremely useful if you have multiple users of various heights using the machine. With single stride length machines, someone is always going to be a little bit uncomfortable. Plus, switching up the stride lengths can help you target different muscle groups in your legs! The adjustable stride length is awesome…LOVE IT! 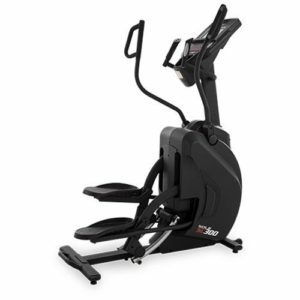 This machine has a smooth and natural elliptical motion like all rear-drive ellipticals from Life Fitness. The E5 comes with sophisticated heart rate monitoring. It includes a wireless chest strap. Use Activity Zones to gain motivation and guidance through different motivating workouts. We like how this coaching program includes Total Body Trainer and Leg Sculptor Modes. The price is a bit high on this machine. Yes, it’s an awesome machine. Yes, it will last you forever. But do you really need to spend $4,000 on an elliptical? You should consider some lower priced machines before you settle on this option. 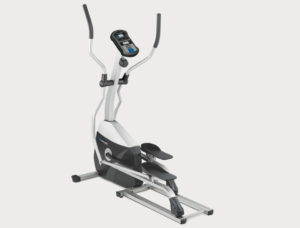 Also see the Life Fitness E3 Elliptical Review.